Les Amandiers is an idyllic family summer rental but it's also an absolute treat in the winter and we've enjoyed many wonderful Christmases here. It is south-facing, set on a hillside in its own grounds with spectacular, panoramic views and an architect designed beautiful private pool and sunbathing terrace. Approached via a little lane, it has a pebbled drive and parking for 3 cars. This romantic rose-coloured old stone house is quietly situated amongst its own terraces of 2,200 m2 planted with almond and 45 olive trees. It overlooks the ancient, little village of Tourrettes and beyond it to St Tropez and the Esterel Hills. It is a l minute walk to Tourrettes and a short (8 mins) walk to Fayence for ones morning croissants, 15 mins to the lake and 30 mins to the nearest beach. It is ideally situated to explore the coastline, towns, mountains and general allure of Cote D'Azur. The house sits on a south facing grassy terrace upon which our covered dining terrace opens directly into the pretty sitting room. With its Provencal fabrics, its warming open fire and two sofas the sitting room is charming and especially cosy in winter. It adjoins the small but well-equipped kitchen which has a round dining table and door to the terrace. Even in winter we enjoy drinks and meals on the amazing south-facing terrace which even then is often bathed in sunshine. First thing the evocative mist over the mountains is a truly beautiful sight and looking to the right one looks across to the ancient village of Tourrettes. In the evenings the village is beautifully lit and it would be hard to find a more lovely setting! The same view is enjoyed from the main bedroom which is a good size with a door and a Juliet balcony over the terrace. The second twin bedded bedroom is also a good size and is on the 2nd floor. The 3rd bedroom is small with bunk beds but also a wardrobe and chest of drawers. This is our own much-loved home, rather than a commercial rental and is we think, attractively furnished in simple, Provencal style. The surrounding area: Fayence, a short walk from the house is bigger and busier than Tourrettes, a delightful old village bustling with life and attractions. The charming village square markets are frequent and you will find local pottery, fabrics as well as fresh vegetables, cheeses and local specialities. The area has a number of supermarkets too. Near-by is the local Marche Paysan (Farmers Market) which is open 6 days a week in the summer. Produce rarely seen at home can be found - white aubergines and courgettes flowers for example! Les Amandiers is glorious all year around. In the winter, ideals for long lets, very cosy inside and one often awakes to low-lieing mists over the valley. We are very excited by the opening of a lovely wine bar in the village (Tourrettes), run by Emily a friendly English girl. It's in a gorgeous setting and has become a bit of a magnet and has brought together many local people in the winter. The countryside is rolling hills and wooded hillsides dotted with picturesque, perched villages and interspersed with luxuriant valleys and deep gorges sparkling with fast-flowing rivers and crystalline rock pools. The local villages of Seillans, Callian and Montarauroux are a medieval treat. Fayence is very accessible. BY TRAIN: TGV/ Motorail: Nice 1hour, Frejus/St. Raphael (45 mins). BY AIR:Nice Airport 45 mins: Many chartered airlines + Easyjet. Local activities: The summer brings an outdoor jazz festival, concerts, firework displays and historical and family attractions. Les Amandiers itself offers contrasting holidays from an extremely peaceful one, perhaps painting on the terrace (tuition available) lazing by the pool followed by walking in the picturesque cork forests behind the house and sampling local Provencal dishes to a very active time using it as a base to explore the local beaches and general allure of the Cote d'Azur or closer to home visit the many historical, medieval villages and superb Lac St Cassien is only 15 mins away. It is large and offers swimming, fishing, canoeing, pedalo-hire, mountain-biking, sailing, hiking and lovely picnic areas as well as a low-key children's 'swinging' park. There is plenty of horse riding or try gliding at the world-famous Gliding Club a truly spectacular environment for experienced pilots (also a lovely little restaurant in the grounds!). 5 mins drive away is the world-class Terre Blanche Golf Club, a paradise for Golfers. The always breathtaking Gorges du Verdon which are known as Europe's answer to the Grand Canyon are always worth a visit. Slightly closer to home, the Siagne and Siagnole rivers offer all manner of beautiful scenery. Painting Holiday + Cote D'Azur + Beaches: A delightful and talented artist friend has fallen in love with the house and area and is keen to offer painting holidays at Les Amandiers. Please contact us for further information on this. The Cote d'Azur has been known since early 19th century as Europe's leading playground. As a holiday destination it is unsurpassed in the world, offering a beautiful stretch of coastline backed by the jagged peaks of the Alps, superbly maintained top class resorts, magnificent promenades and gardens, as well as a plethora of historic towns, ancient hilltop villages amidst fabulous countryside with an exceptional climate, cuisine and wine. The coastline is an ever-changing series of glimmering bays and dramatic cliffs falling straight into the sea. The coastal towns are renowned the world over and the coastal drive from La Napoule to St. Raphael is full of dramatic scenery backed by the craggy red mountains of the Esterel National Park. Here you will find our best beaches (35-20 min drive). We live in Richmond upon Thames, near London and have 2 teenage girls and our black lab Florence who sometimes dons her beret to join us in the south of France! My husband works in media and with his frequent travels finds Les Amandiers a perfect bolt hole to escape to. As you will gather it is very much our much-loved second home, full of personal touches - Provencal fabrics for example and, we're told, it has a lot of character, perhaps different from a standard rental property. We've always wanted a house in Provence and were enchanted with the ancient unspoilt village of Tourrettes whist staying with a friend who's had a house for many years there. On a subsequent trip we looked over Les Amandiers and fell in love with it - most particularly the incredibly beautiful, panoramic view bowled us over. The house too has masses of charm, we just had to have it! We have had wonderful times in the years following with our own growing family and visiting friends. And now after many years of waiting for approval we have finally putting in a new pool immediately below the terrace which we are really excited about. We adore our French home, all the stresses of life just melt away after an hour or so of being there ..We have two girls of 16 and 19 who love the house too. They're older now but when they were younger we felt happy to let them roam freely in the village and around and about in a way that just doesn't seem possible at home, transporting them to a rather bygone age befriending the local cats, checking out the market or messing about in the river down the road, their ‘dingly-dell’. Since the house is perched on a hill we could usually spot them quite easily. They are mad about horses and ride locally too, there’s a wonderful riding school about a mile or so away and it is much cheaper than UK. There are lovely walks to be taken straight out of our garden gate my favourite being following the lane at the end of our drive upwards passing along the river and into open countryside fringed with the cork trees. One of France’s major gliding venues lies just at the foot of Fayence. The area is a paradise for cyclists, hikers and walkers, not forgetting water-sports enthusiasts who are served by the superb Lac St Cassien nearby. For golfers, the world-class Four Seasons Terre Blanche resort is only 5 minutes down the road. The breathtaking Gorges du Verdon, known as Europe's answer to the Grand Canyon are always worth a visit. We’ve owned Les Amandiers for about 10 years and it is a much-loved house which we feel is particularly special. It's magnficent terraces and pool overlooks the unspoilt, romantic village of Tourrettes, 2 mins walk away. Markets, restaurants, the lake, the sea and the proximity to all the 'hotspots' of the Riviera are a stone's throw away and a particular lure we thought in years to come for our growing teenagers! Winters too are particularly special and the mists over the Esterel Mountains in the morning are unforgettable. The house faces south and we’re blessed with the sun all day long. From our terrace you can see for miles over an incredibly beautiful, unspoilt vista towards the Esterel Mountains, St Tropez and the coast. We sit on a hill just above the lovely village of Tourrettes, about two minutes walk away. The village is medieval and totally unspoilt due in no small part to its mayor who believes fervently in preserving its beauty and authenticity with little encroachment from the last few centuries. A major concession of his however are the amber lights which illuminate the village at night - making it a beautiful sight to gaze upon over dinner from the terrace! As of May 2013 we have just completed a new swimming pool which we are absolutely thrilled with! It's a few steps down from our main front terrace and we hope to have many long lazy days swimming and lieing on the terrace around the pool! Our most popular beach location at the moment is Theoule Sur Mer which is about 25 mins away and is a residential seaside town. There are a number of different beaches with nice little restaurants and cafes, jet skis, sailing boats etc. If you take the coastal road south from there towards St Rafael it is breathtakingly beautiful and incredibly scenic as the road winds round above azure waters, wonderful little coves to say nothing of the beautiful houses,many Belle Epoque, belonging to the rich and famous! The bathroom though compact is memorable for its exquisite view - a loo with a view! With a toilet and a good-sized power-shower, heated towel rail and cupboards. Our femme de menage makes up the beds with linen and provides towels as well. This is subject to a separate price dependant on the size of the party. Yes many resorts within an hour or so. There is a tennis club in Fayence. A lovely new architect-designed pool 7 x 2.5 metres. Alarmed and with locked railings for children safety. It is opened each year end April/Start May dependant on water temp. Closes October. The pebbled driveway is fringed with olive trees leading from a little lane towards the house with room for parking for 3+ cars. There is a useful 'cabanon' building next to the house where all the garden chairs etc. are kept. Beside the pool is a lovely travertine terrace - a wonderful place to sunbathe soaking up the amazing view. The terrace is in sunshine from morning to late evening in the summertime so whole days can be spent there taking drinks and meals, a barbecue as well, overlooking the village and hills beyond, perhaps followed by a game of boules in the driveway!! A note of caution though - the terraces are sloping and young children should most definitely be supervised when playing on the terraces and shoes should be worn with some grip. The swimming pool is alarmed and gated with iron railings but children should not be near the pool without adult supervision. The owners cannot be held responsible for any accidents. 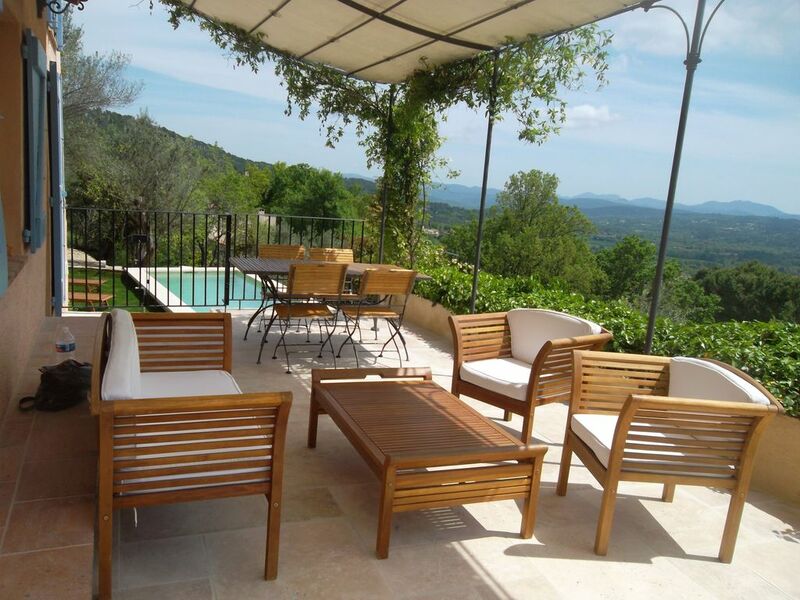 Really lovely villa in an idyllic location, with breath taking views. The pool makes the villa even more special. Walking distance to great restaurants in both Tourrettes and Fayence. Plenty to do in the surrounding areas. We hired electric bikes and did some white water rafting. We had a lovely relaxing time staying at Jill's house and highly recommend it. The house is very comfortable and had everything we needed. It has great views of the valley and watching the frequent Gliders fly through the valley was very relaxing. The drive from Nice Airport was around 45 minutes, Jill provided clear instructions beforehand and when we arrived Monelle was waiting at the house to greet us. She provided all the information we needed regarding the house, pool etc. Jill has also provided lots of useful information regarding restaurants, beaches and other interests in the nearby area. Tourettes is a small, quiet village that includes a very nice local restaurant. A 10 minute walk away is Fayence which is larger and has more options for food and drink along with a grocery store. Larger supermarkets are a 5 minute drive away. The area is very peaceful and the house is in a great location to drive to places such as Cannes, St. Tropez and Monaco (and all the smaller villages in between). We hope to return. Delightful house perched on a hillside on the edge of Tourettes. Short walk into the villages of Tourettes and Fayence, easy day trip to the Côte d'Azur. Spent a great week with 3 teenage kids walking, swimming, kayaking and eating out at some of the extremely good (albeit not cheap) local restaurants. Everything as described, clean, pleasantly rustic. The house has everything you need. Would like to come back. We loved the beautiful view from the terrace over the green hills. The house is perfectly situated near Tourrettes (1 min. walk) and Fayence (10 min. walk) and the coast (45 min. drive). The swimming pool is super and te house has all we needed with 5 persons and Jill Claxton provided all the necessary information and service. We hated to leave!!! Thank you Marlies and we're so pleased you had a super stay. Without wishing to be picky I'd just correct, if I may, that the coastal town of Theoule (our favourite place for a beach) is only 25 mins drive away and this might make a difference to some families. Everything was as described and the house and surroundings were delightful. A peaceful location 5 mins walk to a charming town and village. All the various attractions of the Riviera a 40min or so drive away. What more can you ask for? Ah! Of all the places we've stayed around France, this has to be up there as one of the loveliest. First of all. The Views. We spent from dusk to night in a state of semi paralysis watching the sun go down over the pool. The little village of Tourette gradually lighting up in an amber glow to the sounds of the bells chiming. The best thing was to be away from the village - beautifully private - but then able to simply walk into the town within minutes. Heaven! The pool has the best position ever! Overlooking the village on a sort of cliff. And Jill could not have been more helpful and kind - everything was as described and we didn't want for anything. So nice to have the owner of the home looking after you who actually cares that you have a lovely holiday. Tourrettes is a quiet enchanting medieval village but yet only a short distance from Riviera beaches and Cote D'Azur hotspots. Local Fayence bustles with thrice-weekly markets, bars, bakery, butcher, pharmacy, many excellent restaurants and 2 supermarkets. It remains remarkably unspoilt. A major gliding centre it has a number of golf courses close by. The lovely Lac de St. Cassian, a haven for children with water sports/fishing is 10 minutes drive away and lovely beaches within 30 minutes drive in Esterel National Park. Tourrettes is an easy 45 minutes drive from Nice Cote d'Azur airport and 20 from A8 motorway giving easy access to the towns and beaches of the captivating Riviera coast such as Cannes, Nice, Antibes,St. Raphael, and St. Tropez. If you prefer to explore locally medieval hilltop villages, vineyards, chateaux and mile after mile of pine and olive groves abound. Grasse, the lovely world capital of perfume is 30 minutes and spectacular Gorges de Verdon l hr away. Golf: The much acclaimed Terre Blance 18 hole Golf Course is 5 mins drive away and offers a lovely setting and superb facilities and course. There are a number of other courses as well within striking distance. Pricing is inclusive of gas, electricity, pool cleaning and garden maintenance. The pool is open from May to around mid October depending on water temp. You will be met on arrival and the house will have been cleaned, laundry supplied and the beds made up. This charge will be actual cost from our femme de menage and dependent on size of party. Longterm winter lets, special rates apply.